I made this dip for my in-laws Christmas Eve party and it was a big hit. 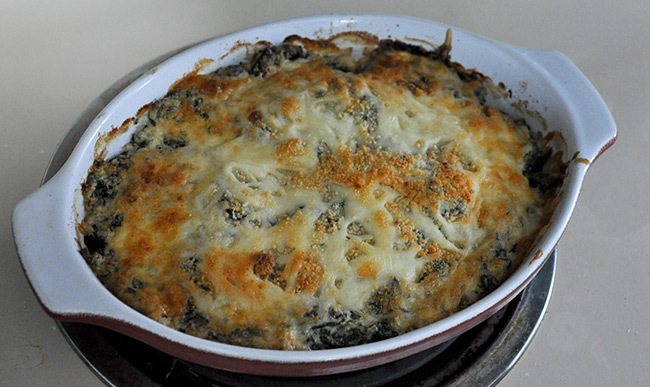 It isn’t a healthy food by any means, unless you want to pretend that the spinach and broccoli cancel out the cheeses and mayonnaise, but it is delicious. It is perfectly acceptable to have this rich treat every once and awhile. It makes a great topping on the Country French bread or even the Cranberry Pecan boule (the sweetness of the cranberries contrast nicely to the rich creaminess of the dip). Preheat the oven to 350 degrees. Lightly grease a small baking dish. In a medium bowl, mix together cream cheese, mayonnaise, Parmesan cheese, garlic, basil, half of the mozzarella, salt and pepper. Gently stir in the broccoli and spinach. Transfer the mixture to the prepared baking dish. Top with the remaining mozzarella cheese. Bake in the preheated oven for 25 minutes, until bubbly and lightly browned.